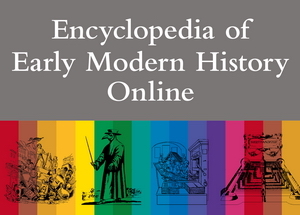 The Encyclopedia of Early Modern History is the English edition of the German-language Enzyklopädie der Neuzeit. This 15-volume reference work, published in print between 2005 and 2012 and here available online, offers a multi-faceted view on the decisive era in European history stretching from ca. 1450 to ca. 1850 ce. in over 4,000 entries. The perspective of this work is European. This is not to say that the rest of the World is ignored – on the contrary, the interaction between European and other cultures receives extensive attention. New articles will be added on a regular basis during the period of translation, for the complete German version see Enzyklopädie der Neuzeit Online.